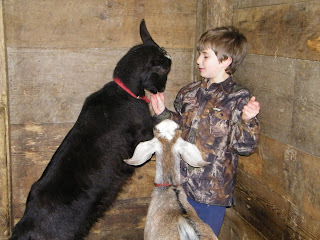 Spring Peeper Farm: Otis and friends. Well, once again it's been non stop here. We are at that point that we are starting to wonder if it's all worth it. There's so much work and it just never stops. We don't have 2 minutes to ourselves. We have decided as a family tonight that we are going to set a day or evening where we are going to do something for just the family. The problem is finding that day. Today was a beautiful day, as has been the last week. I hope that spring is finally here. 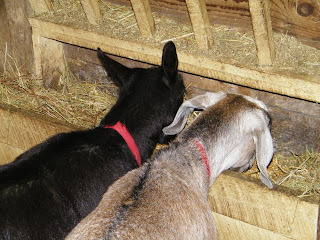 The goats were happy outside and I cleaned out the chicks and the greenhouse. J. did the chicken coop. A pig pile! This was taken last week. They've grown alot since then. 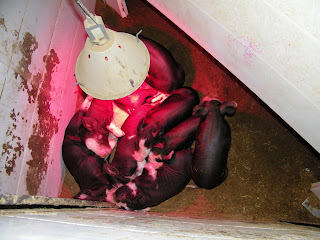 The piglets are doing great. Someone came and picked one up after they were only one week old. We didn't guaranteee that one. The person understood. Dave finally made a door for Wilbur so he can go outside and divided the pen with electric wire. Now we know why people tell us to put a barricade on the OUTSIDE of the electric fence. When you train pigs to the electric fence they actually run into the fence if zapped. They don't back away from it like a normal animal. Twice did Charlotte run through it and broke it! Sometimes pigs aren't the brightest bulbs in the bunch. J. feeding Otis for the first time. 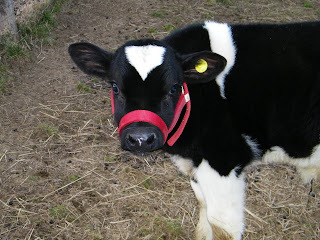 He was only 3 days old in this photo. Well Otis is here! He's the cutest. I have no idea how we are going to eat him this fall after bottle feeding him and cuddling him. I know we shouldn't...but how can we not! I mean look at him. He's got big beautiful eyes and such long eyelashes. Otis and his first time outside. I think this is the part I become vegetarian. We've been bottle feeding him twice a day now and I've also started teaching him how to eat grain. He prefers slobbering all over me than eating the grain at the moment. Esme and Whisper at the chow hole. Esme and Whisper are now forever buddies. I have tried putting Febe in, but she terrorizes the poor things. Even outside she bullies her. I'm not liking that. J. is having a ball, though. They love him especially when he shows up with treats! After much anticipation we have a grand total of 19 chicks! I put 53 to hatch and we had 20. One died after a day. This might not be a good average, but compared to last year it's fabulous! 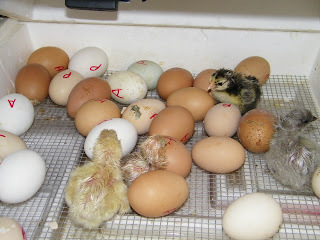 Last year I put 30 eggs twice and got only 3 chicks. We were so disappointed. So 19 is pretty good. Hatchlings a few days later. 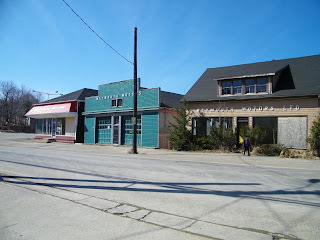 Last week they demolished 3 buildings from our downtown area. It's really sad to see them go. They've been there for 60+ years. They were ready to crumble since nobody was taking care of them. Most of the buildings in Weymouth are built over the water, so they're on cribbing. Needless to say if it's not taken care of the cribbing rots. Downtown Weymouth. Not very big. They're planning on building an industrial building there. I had to give them ideas of colour schemes. I think they liked a few of them. I was so excited yesterday. 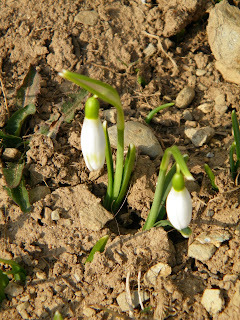 I have flowers coming up! !My garlic is also starting. I was worried about the garlic, since I had planted it so late in the season. We actually had a snow storm the day after. Well I think that's all I've got for this week. I know I'm probably forgetting something, but...oh well. Hi Lisa, I understand what you say about being so busy! 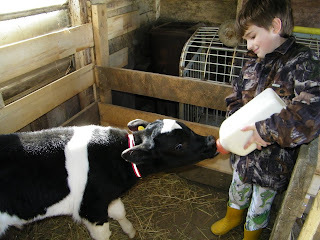 You farm is awesome ~ I've been talking to my husband about calves like Otis, but I really don't think I'd be able to butcher and eat my "babies". My husband keeps telling me that after the first animal or two I will not get as attached. I don't know, Otis is just so cute! And the chicks, they, too, are cute. 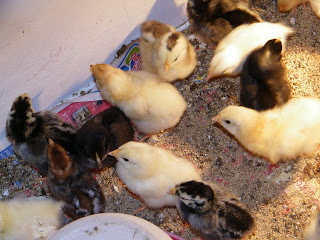 My husband has been wanting more chicks, I've been putting him off, reminding him how they'd be more work for us. But I keep seeing other people's chicks these days, and I think I'm going to give in & raise some more chicks soon! Take care, thanks for the smiles from your farm! It does take a lot of work to keep a hobby farm going (I say hobby because we all have outside jobs). Your piglets look nice and sturdy. And yes it will be hard to eat Ol' Otis this fall. What are you going to do with all your hatchlings? I'm going to try some garlic this year. I'm told the flavor is a lot stronger than store bought. Is that true? I found that the garlic was a bit stronger but not too much. The hatchlings are to replace my older hens. Any roosters in the bunch will be raised then butchered and used as "stewing hens". They have a wonderful flavour for stews, fricots and rappie pies.